home > decorative > BOrocks! 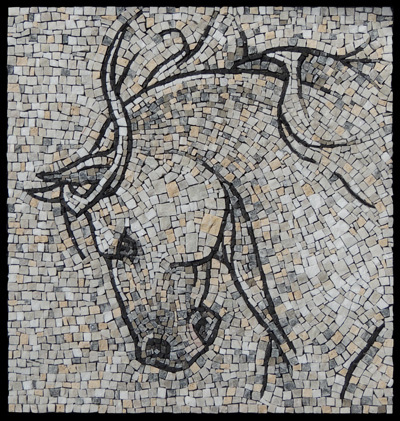 Selected for the "Mosaic Arts International Exhibition 2013"
I recently participated in a workshop offered by the Orsoni folks. They were visiting the US from Venice, where they manufacture the lovely glass cubes called smalti. I wanted to advance my smalti cutting skills and experience their teaching style while they were conveniently on this side of the pond. The workshop was well worth it. To me the most successful endeavors mean: you receive what you expected but you also get treasures you never imagined. The instructor Antonella and her right hand Liana are skilled at working towards your level, thus tailoring their advice to each student. In order to focus on the cutting, I chose to work on a value study of an eye. An odd thing really, leaving all the beautiful piles of colored glass on the table and only choosing the greys. But getting bogged down in colors would have been a distraction. I was able to focus on cutting. I worked with a modern laying pattern that is looser utilizing various sizes & shapes of tesserae. This method still follows many of the same principles of andamento as in a classical roman style, but in a more playful manner. Experimenting with this style, as well as watching Antonella work on a section of my project, were the unexpected treasures. I wanted to repeat this experience of being immersed in subtle value shifts again. Combining this, with my ever present desire to "draw" in rock, the method of how to execute my next piece was clear. Now I only needed the subject. This eluded me for quite a while. At some point, while waiting for a friend in my car, I started doodling with a pen on a scrap of paper. One of the sketches was similar to what I have been drawing since elementary school ... no, not Snoopy this time, but horses. Why look further I thought? And so the doodle was refined and BOrocks! was born. ps. Note that even though this all began while working with glass, BOrocks!, as indicated in the name, is actually made of stone.